The Dial Thermometer for the oil pan, frying, barbecue temperature control. Large dial, you can reads internal food temperature instantly. Clear and accurate scale, you can get the food temperature. The durable, stainless-steel casing provides strength and corrosion resistance. Increase the service life. Would you like to change your way of life, starting from KT THERMO Dial Thermometer? If you want to make more delicious food, please LOOK HERE. 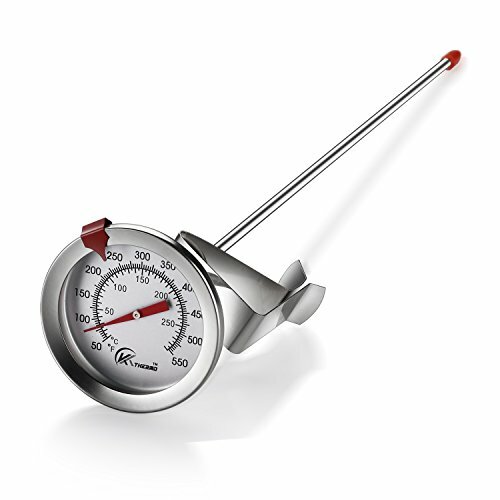 You don’t have to worry about the temperature of the food because since now you have the dial thermometer to help you. Try another kind of lifestyle by CLICKING the ADD TO CART button NOW, and KT THERMO provides you with the best option. KT THERMO is a professional thermometer manufacturer, providing optimal products aimed at satisfying our daily-life. We have the most advanced bimetal movement process control equipment, circuit board SMT chip production equipment and dozens of the world's leading temperature test equipment. We have professional R & D team, the new products had more than 20 utility model patents, and some products for the United States by the NSF certification, the European CE and other relevant certification. If you have any questions about this product by KT THERMO, contact us by completing and submitting the form below. If you are looking for a specif part number, please include it with your message.